In2Cricket U5-U7 | Ferny Districts Cricket Club Inc.
Saturdays 8.45am to 10am Ferny Grove Sports & Recreation Centre, Tramway St, Ferny Grove. The first session is due to start in October 2017. Anytime, but knowing beforehand does help our planning so phone us, come to one of our sign-ons or better, register online here. 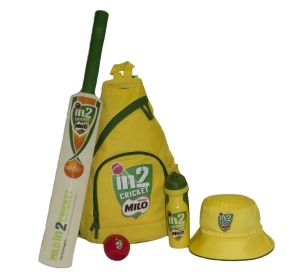 $120 - which includes provision of all equipment and a Milo In2Cricket participant pack shown below. On-line payment: The on-line registration process requires selection of the applicable fee for subsequent payment. The clubs requests on-line payment to be made at the time of registration. On-line payment feature is available during the MyCricket registration process where a payment receipt is emailed as a record by MyCricket. Additionally, FDCC can process payments made by Cheque if required. 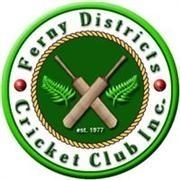 Make cheques payable to ‘Ferny Districts Cricket Club’, and either posted to PO Box 639, Ferny Hills Q 4055 or delivered to the Kiosk on Saturday morning during the first weeks of the season. Payment must be fully paid by 1 November 2017. No way, the more there are, the louder the cheering - tell your friends. We have a small team of coaches and helpers, but Dads and Mums on the field are very welcome to encourage the players and assist us. Equipment supplied, bring a drink, and always remember to sunscreen before leaving home in the morning. Brisbane North Junior Cricket Association rain cancellation is advertised on radio 4KQ 693 at about 7:10am on the day or keep an eye on our Facebook page. When the Weather Bureau forecasts a maximum temperature of 38C or more for the day in the previous evening news (or webpage www.bom.gov.au) the session will be postponed to the following week (the actual temperature between 8.45am and 10:00am will be significantly less than the maximum forecast). At any time, sessions may be stopped earlier if the temperature becomes a concern. Under 8's and 9's is a highly modified 3hr game format suited to most 7-8 year olds with some hand-eye coordination and are ready to learn and play. In2Cricket is a suitable alternative for those 7 or 8 year olds who aren't ready for that, don't know if cricket is their thing or who are still working on the hand-eye thing. It's your choice, but talk to us if you need guidance. Not really sure? Provided an indemnity is signed beforehand, we are happy for the really unsure to try a session before signing up. See the "Getting Involved/Milo in2Cricket" menu option at http://www.in2cricket.com.au/ to find another centre that may be suitable for you. For the parents, please check over the following Cricket Australia behaviour codes with your In2Cricketers.